When choosing the best aluminum polish it is quite important that you choose the one that will give you an extraordinary shine and make your polished aluminum look like a mirror. No matter if you need it for your semi truck, wheels, boat, or motorcycle; you want the best for your aluminum surfaces. When new, aluminum surface looks like a million dollars, but with time it starts to fade and it requires a proper care. A good quality aluminum polish can make your polishing job way easier and it will give you exceptional results. Now, most of the polishes you can find in retail stores can work just fine. However, if you want perfect shine that will match the professional de​lears, you might want to go with something a bit better. With good polish, all you have to do is attach your polishing pad and apply the proper amount of cleaner and you are on a good way towards the perfect mirror-like shine. 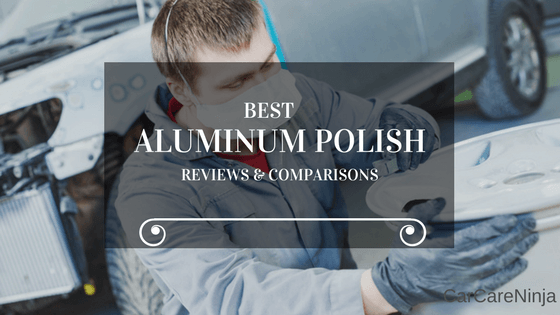 In this guide, I will cover the things you need to consider when shopping for the aluminum polish and review some of the ​top aluminum polishes on the market today. Mothers Mag and Aluminum polish is a legendary metal polish made by Mothers. The secret formula of this product balances an impeccable shine and ease-of-use brilliantly. It’s an ideal polish to use for aluminum parts and wheels, as well as for bras, alloys, and accessories. The application is quite easy and all you need is a clean cloth and a little bit of elbow grease. The product is so strong that it can put a beautiful shine even on the most neglected metals while remaining gentle enough so it can be used on a regular basis. Rolite Metal Polish Paste can clean, protect, and polish almost any metal, not just aluminum. It’s ideal for use on aluminum, bronze, brass, copper, chrome, nickel, gold, stainless steel and much more, and it will put a brilliant shine and protection on them. It works great even on the painted surfaces making it great for marine, motorcycle, automotive, industrial, and sporting goods. However, it is not recommended that you use this product on plated metals. Rolite Metal Polish Paste will remove oxidation and tarnish and it will leave a protective coating on your metal surfaces. It’s a high-performance product made by an American company with over 40 years of experience in the field. This particular product is basically chemically treated cotton that can clean and polish your aluminum surfaces easily and make them shine like chrome. It can also be used for other metals such as gold, silver, chrome, and brass. Durogloss Cotton is a nonabrasive chemical cleaner that can bring back to life your flat aluminum. It removes tarnish, rust, and oxidation without scratching or staining your metal surface. Surf City Garage aluminum polish features a special formula that polishes aluminum and removes oxidation without scratching it. It also works perfectly on stainless steel and chrome. The paste polishes no matter how it’s applied (by hand or by machine), and it works twice as fast and ensures the safety of your aluminum surfaces. It is one highly proficient polishing paste. Some of the users are even going so far that they claim it’s one of the best polishing pastes on the market if not the best. This all-in-one product act as a polish, shine, and sealant. It’s a silicone free polish that can easily remove 1500-3200 grit scratches and make your aluminum surface shine like it’s new. Since it doesn’t contain silicone you can be sure that you get true results that will last for weeks of washing. It works exceptionally as a final product that helps you achieve the impeccable shine. It removes lighter scratches such as key scratches and swirls and restores the color and shine while the sealant locks it all in. This is another product by very well known company Mothers. It’s a wheel cleaner that is formulated for easy cleaning of uncoated polished aluminum and anodized wheels. It also works really well on clear coated, painted, color coated, modular, steel, chrome, and custom wheels. It is quite easy to use – spray on – hose off. The product penetrates and dissolves all types of dust, grease, grime, and dirt, making it very easy to rinse. The product is gentle to your wheels yet very effective. The smell of it might be a bit bad for some people, but the smell doesn’t stay after you rinse the product so it’s ok.
Polish All is not just for aluminum, you can use it to polish painted surfaces and plastic as well. It's easy-on, easy-off product in a form of liquid. It safely removes the oxidation and finer scratches from your aluminum, plastic, silver, etc. You can use it with just washing cloth or you can use power tools, the results will always be great. The users are generally very pleased with this product and most of the comments and reviews are quite positive, which most certainly means that this is one great product. Unilume is a pretty good product by Autocare. It can be used by hand or with help of power tool. It’s quite easy to apply and reapply. All you need o use this product is clean dry cloth. It will leave an excellent shine on your aluminum, chrome, brass, or stainless steel surface without a problem. The product is ammonia-free and fast drying. The important thing to note when it comes to this product is that it doesn’t meet CARB standards which is important for the residents of California. Whether you’re putting the final touch on your polished aluminum wheels, valve cover, stainless steel nautical gear or brass ware around your house, this nifty paste will do the excellent job. You will really appreciate how easily it removes oxidation, tarnishes, and light scratches. Just a little bit of paste on a soft cloth does the excellent job without the need for excessive effort. The paste itself does the entire job. However, it is not recommendable to be used on silver and gold items. This product is one of those who clean, shine, and protect your metal surfaces, all in one step. It removes oxidation, tarnish, and dulling road film with ease and brings back the luster to your machined, forged, polished, or painted aluminum and mag wheels. It doesn’t contain any acids, making it safe to use on almost any metal surface. When utilized with help of power tools, this polish gives you that mirror-like shine, but it also does a great job if used by hand. It is fairly easy to apply and reapply and it does what it is supposed to do. Generally speaking, you want the polish that is going to do a perfect job while being environmentally safe and certified by the EPA’s GreenSeal or Design for the Environment. The good cleaning and polishing products will contain non-toxic chemicals and no ingredients of health concern or those of low health concerns. Additionally, you want to look for the products that are properly packed in recyclable containers. Concentrated formulas are known to be more efficient than the standard formulas because the standard ones, can contain more than 20% water. ​Furthermore, I personally prefer the bulkier packages than the smaller ones because I want my polish to last for more than just one polishing. When you are looking for the best safe aluminum polish it is very important that you note that many products of this type contain chemicals that might pose a potential human health hazard. The same chemicals that give these products their polishing power can also have other characteristics such as corrosivity which can be dangerous for human health. Most of the washed down products end up in a sewage system and then are discharged into lakes, rivers, or oceans. Some of the ingredients of the aluminum polish are known to degrade into persistent compounds and they may pose an ecological risk. Most of the aluminum polishes are now packed into plastic containers that can be recycled, but still, most of the users dispose of the packages as trash and therefore add to a community solid waste. Of course, you want your polish to do the proper job. This means that you need to make sure it removes oxidation growth and that it stains neatly. A health hazard rating of the ingredients needs to be low. Check if there are some indications that the product might exhibit some other negative aspects. Make sure that the package is recyclable. Make sure that the product is effective and that it will remove the oxidation growths from your aluminum surfaces. Polishing aluminum is not really a hard process and it is quite easy to learn it, however, it is very important that you are certain that you know how to perform each step. It doesn’t matter if you are polishing small aluminum items in your kitchen or large pieces in your garage, the process is quite similar. First of all, clean your aluminum surface with water and detergent or soap. Regular dish soap should do just fine for smaller aluminum items but for larger pieces, it’s better to use a heavier detergent. Wash your aluminum surface with sponge or washcloth and then thoroughly rinse off the soap with warm water and dry your aluminum with a clean microfiber cloth. Make a tartar or cream paste by mixing equal parts of water and cream/tartar. Mix until it looks like a paste. Use a washcloth or microfiber cloth to coat aluminum. Rinse thoroughly with hot water and then dry it off with clean microfiber cloth. When sanding, always use safety goggles! Use sanding machine or sandpaper over your aluminum surface. To achieve the best results it’s best to start with a medium grid and then gradually work your way to fine sandpaper. For the best possible results, it is recommendable that you use water based polish. Try to avoid metallic polishes because they usually do more harm than good. If you polish your cookware, don’t polish the surfaces that come in contact with flame. Never use baking soda or any other alkali-based cleaning products because they can cause discoloration of the aluminum. Try to avoid abrasive cleaners because aluminum scratches quite easily. When trying new products, it’s best that you start with smaller pieces or hidden areas just to make sure there are no any unwanted effects. To avoid spots and streaks, dry your aluminum immediately after rinsing. Finding the best aluminum polish depends on several factors, but the most important one is knowing the type of finish on your aluminum surfaces. Each product has its own qualities and its own purpose.